Last month, Picasa Web Albums started to support HTTPS and now it's enabled by default. It's probably the only popular photo sharing site that uses an encrypted connection by default and that's really impressive. 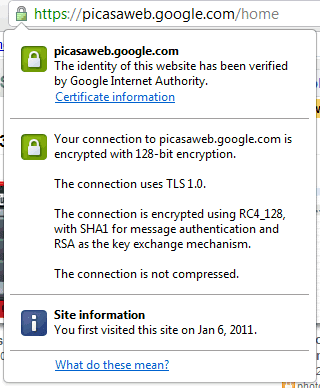 Picasa Web Albums is not the only Google service that has recently switched to HTTPS. Google Calendar, Google Docs, Google Sites are three other services that only use encrypted connections. You no longer have worry about editing the URL and replacing "http" with "https" because Google automatically redirects URLs to HTTPS. A cool thing about Picasa now being in HTTPS is that if you upload a photo to that site and then use it as a signature in Gmail, it won't break the latter's HTTPS connection. I like that!